Few places can better test the ability of an SUV than the Atlas Mountains of Morocco, home to stunning desert landscapes, strange and wonderful roads and breathtaking gorges. It was here Citroen chose to launch its all-new SUV, the C5 Aircross. Comfort is Citroen's new focus; inspired by customers, the French car-maker believes this to be its unique selling point. First impressions matter when it comes to buying an SUV and Citroen's new C5 Aircross is certainly striking, with an imposing grille and discrete air bumps. Inside, the car is - as you might expect - comfortable and the armchair seats are not only supportive but restorative. The console is dominated by an eight-inch digital screen infotainment system to access the multimedia system, together with the phone, air conditioning and navigation. You will fit three children in the back without initiating a turf war and the boot is similarly impressive with 580 litres and best in class with a total 1,630 litres of storage when all three back seats are folded. There are only front-wheel drive versions offered, although the PSA's Grip Control system is optional, and buyers will have the choice of five engines - a PureTech 130 6spd manual, PureTech 180 EAT8 petrols and BlueHDi 130 6spd manual, BlueHDi 130 EAT8 and BlueHDi 180 EAT8 diesels. 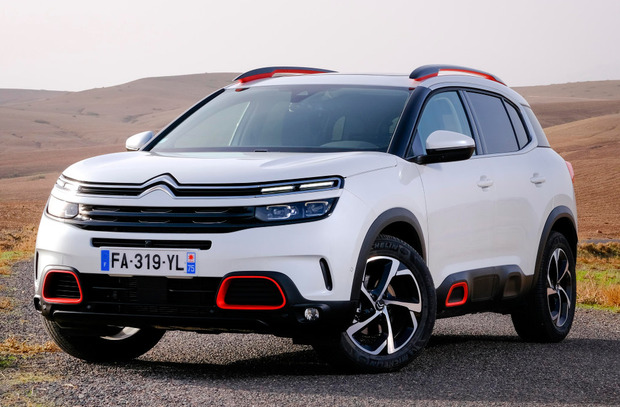 In 2020, the Citroen C5 Aircross will be the first vehicle in the line-up with a petrol plug-in hybrid engine. Driving in Marrakesh is not without its challenges, with ambiguous traffic laws, erratic drivers and unforeseen obstacles; scooters, mopeds, stray dogs, rebel goats, farmers on mules, children en-route to school - we meet them all. Away from the urban madness, we travel south en-route to the foothills of the Atlas Mountains. As we climb higher, the road narrows and twists and the barriers at the edge disappear. On the undulated dirt roads, the C5 Aircross makes molehills out of mountains. The C5 Aircross is not a small car and leans going into corners, but it proves to be sure-footed and relaxing over some seriously rough conditions. Official fuel economy figures generally need to be taken with a pinch of salt, but Citroen reckons that the petrol will deliver almost 5.2 litres per 100km, while the abstemious diesel returns 4.1 litres per 100km. The C5 Aircross is packed with features to enhance safety including autonomous emergency braking, active lane departure warning and blind-spot monitoring. Prices for the new car will be announced in the new year and it will be in showrooms from mid-February. Citroen has launched a distinctive SUV that distinguishes itself from the tough competition, mostly for its comfort; a feature that will be appreciated by driver and passengers on a daily basis. But in a crowded market, opting for one over established rivals such as the Peugeot 3008, Renault Kadjar, Hyundai Tucson, Opel Grandland X or Volkswagen's Tiguan, will be a matter of price. With funky looks, spacious interior and low running costs, the C5 Aircross is a capable, compact SUV, but with only front-wheel drive and five seats, the price will need to reflect its limitations.